Explanation: Four Geminids flash through northern skies in this wintry night skyscape. The bright fireball and 3 fainter meteors were captured in a single 10 second exposure, near the peak of December's Geminid meteor shower. Reflecting the fireball's greenish light, a partially frozen Lake Edith in Alberta Canada's Jasper National Park lies in the foreground, with the Canadian Rocky Mountains ranging along the northern horizon. Of course, the glacial lake is cold even in summer. 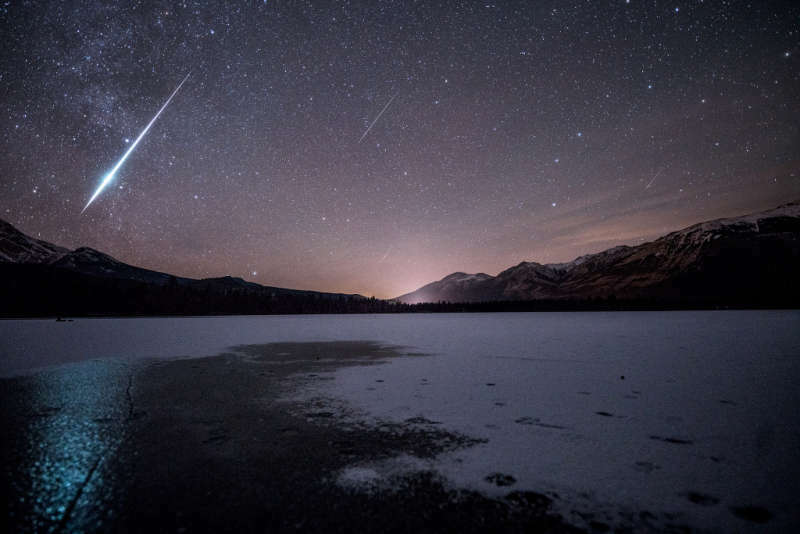 But photographer Jack Fusco reports that he experienced -9 degree C temperatures that night while enjoying one of the most active meteor showers he's ever seen.